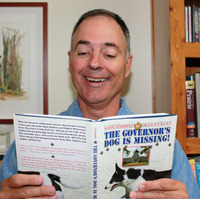 Sneed B. Collard III (see also "Sneed B. Collard") is a biologist, world traveler, speaker, and author of more than eighty books for young people, include the novels Dog Sense, Double Eagle, The Governor's Dog is Missing, and Hangman's Gold. His two recent science titles, Fire Birds and Hopping Ahead of Climate Change, both were featured on the NSTA-CBC Outstanding Science Trade Books list and named Silver Honorees for the Eureka! Nonfiction Award by the California Reading Association. "Hopping" is also a finalist for the prestigious AAAS-Subaru SB&F Prize for Middle Grade Science. Collard holds degrees from the University of California at Berkeley and U.C. Santa Barbara. He lives in Montana. To ask Sneed B. Collard III questions, please sign up. "Absolutely gorgeous and wow, that eye-catching cover is terrific. I'm sorry the cover art doesn't show here! This is a beautiful book design and production. We’d love your help. Let us know what’s wrong with this preview of Warblers & Woodpeckers by Sneed B. Collard III. Of my eighty or so titles, I can't think of one that I am more proud of, and I thought some of you might be interested in the story behind Woodpeckers: Drilling Holes and Bagging Bugs. I have always loved woodpeckers since watching Acorn Woodpeckers Of my eighty or so titles, I can't think of one that I am more proud of, and I thought some of you might be interested in the story behind Woodpeckers: Drilling Holes and Bagging Bugs. I have always loved woodpeckers since watching Acorn Woodpeckers riddle telephone poles full of acorn storage holes where I used to live in Southern California. A few years ago, as I began to get more and more interested in birds, I took a deeper interest in these charismatic creatures. Why? With their bold red markings and larger sizes, woodpeckers were easier to identify than many other birds. I also began to appreciate how important they are in controlling pests and drilling out homes for other birds. In fact, during my journey to write about woodpeckers, I got sidetracked writing another book, Fire Birds, which explored the importance of burned forests to woodpeckers and many other birds! After Fire Birds came out, however, I resumed working on Woodpeckers. I sent it out to more than a dozen publishers and, though many of them seemed intrigued, none fully embraced the concept. Meanwhile, my son, Braden, and I had been getting deeper and deeper into both birding and photography. By 2017, we had collected enough high-quality woodpecker photos to fully illustrate a book, so I decided to go ahead and publish the book under my own independent company, Bucking Horse Books (www.buckinghorsebooks.com). Woodpeckers is a culmination of so much that I've tried to do as a writer over the years. The text is joyously playful and humorous while revealing dozens of new woodpecker facts that people just don't know about. I enlisted top woodpecker experts to share insights about several favorite woodpecker species. The photos and design also rank with the best of any of my books. To my satisfaction, the book is being enthusiastically received, with an early starred review from Booklist and terrific blog reviews by Mrs. Yingling Reads and Growing with Science. One of readers' favorite features is the "Photo Bloopers" section I added to the end of the book. As Braden and I were going through our woodpecker photos, we kept lamenting that we hadn't gotten good shots of species such as Arizona and Scarlet-backed Woodpeckers. Well, I thought, Why not include a bloopers page and use it to discuss the challenges of photographing wildlife? The feature has proved so popular that I plan to include it in future books, too! Writing the book also inspired Braden and I to start a birding/photography/writing blog at www.FatherSonBirding.com that I hope many of you will enjoy and share. If anyone would like to begin a discussion about Woodpeckers, please let me know. I'm also happy to answer any questions that any of you have. Now, on to the next book!